Pengo is excited to introduce the TriDent® series of holders and teeth. 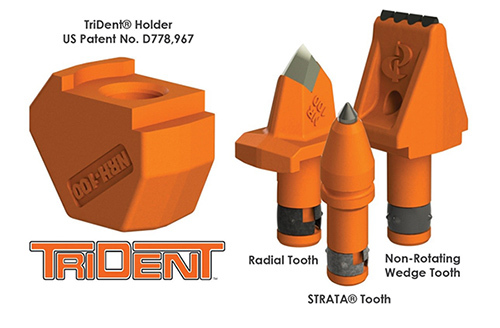 The patented TriDent holders are designed to work with three different types of teeth: the STRATA® conical tooth, a non-rotating radial tooth and a non-rotating wedge tooth. 1, 3, 7 – it’s that easy! One holder coupled with three types of teeth will provide drillers seven different soil conditions to drill in. Whether it is gravel, fracturable rock or non-fracturable rock, TriDent teeth provide maximum performance over standard teeth. TriDent teeth are available in three sizes: 0.87” shank, 1” shank and 1.18” step shank. Contact Pengo Sales at 800-599-0211 or pengosales@pengoattachments.com to place your order today!